Motorola announced on Thursday its new Moto Z3 smartphone, plus an optional attachment that will give the phone connectivity to Verizon’s 5G network. On its own, the Moto Z3 is a fairly typical high-end smartphone. It’s not the most flashy, or the highest-powered, but it’s incredibly thin. And Motorola is also selling it for the pretty great price of $460, exclusively on Verizon. The real magic will come in early 2019 when Motorola’s 5G Moto Mod will be released. In essence, the Moto Mod will make the Moto Z3 smartphone, as well as previous Moto Z phones that support Moto Mods, the first smartphones to support higher-speed 5G networks. It’ll be interesting to finally see the speeds and benefits of 5G when the mod is released. However, you could argue that it’s a premature release, as 5G networks in the US are only available in a few cities at the moment. For Verizon, specifically, there are only four cities that will get 5G coverage by the end of the year. Motorola played it safe with the Moto Z3’s design and specs. The Moto Z3 has a 6-inch display with a 1080p resolution. I have no problem with 1080p displays, but those who are used to Samsung’s Galaxy phones and their phenomenal displays may not be impressed. As far as design goes, Motorola played it safe. Which is to say, the Moto Z3 doesn’t have a notch, like the Apple iPhone X. Instead, it has narrow top and bottom bezels similar, to the Galaxy S9. Overall, it’s similar to previous versions of Motorola’s Moto Z phones. Specs-wise, it’s running on 2017’s Qualcomm Snapdragon 835. It’s not the latest Snapdragon 845 chip that you’ll find on some modern phones, but you’ll find that it still gets the job done very well. One thing that’s impressive is how thin the Moto Z3 is, while packing a battery that’s comparable to most modern high-end smartphones. The Moto Z3 is only 6.75mm thick compared to the Galaxy S9 Plus’ 8.5mm and the iPhone 8 Plus’ 7.5mm. For further reference, the iPhone X is 7.7mm thick, and the Pixel 2 XL is 7.9mm. That’s pretty impressive considering its packing a 3,000mAh battery. Apple’s iPhones have batteries that are under 3,000mAh, so the Moto Z3 should theoretically last longer. Around the back, you’ll find a dual-lens camera system designed to take portrait mode photos and photos with better overall contrast. Both lenses are 12 megapixels, and they’ll complement each other for low-light photos, as well as portrait mode photos. One of the sensors in the camera is monochrome, which means that it captures photos in black and white. Towards the bottom of the back, you’ll find the connection pins for Motorola’s signature Moto Mods, which can add a bunch of features and functionality to the phone. 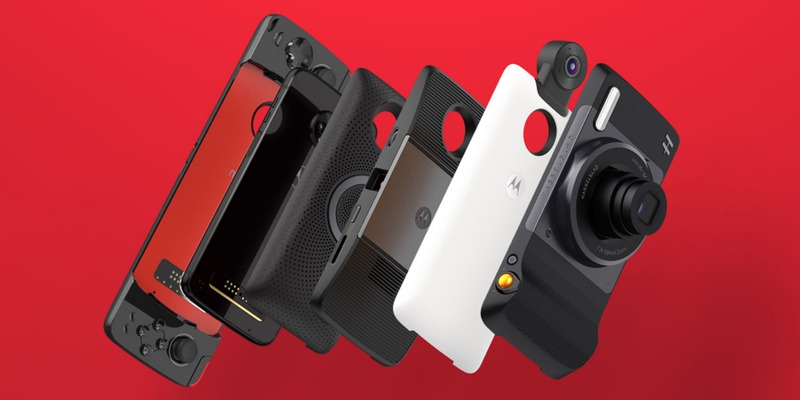 There are 17 Moto Mods you can magnetically snap onto the back of the Moto Z3, including a stereo speaker, a projector, a speaker with Amazon’s Alexa built-in, a 360-degree camera, a camera lens, an extra battery pack, and a few others. The star of the show is Motorola’s new 5G Moto Mod, which will give the phone insane data speeds. But it’ll only work on Verizon’s network, and in four cities to begin with. The 5G Mod for the Moto Z3 will be available in early 2019, exclusively on Verizon’s network Motorola reckons you could get insane speeds that will make today’s 4G LTE feel like dial-up internet. It’ll also come with an extra battery pack to give the phone a few more hours of battery life, especially important when it’s connected to Verizon’s 5G network. With all that said, Verizon’s 5G network will only be available in four cities in early 2019, including Los Angeles, Houston, Sacramento, and a city that has yet to be announced. The pricing details for the 5G Moto Mod have yet to be announced, as well as pricing for 5G-specific plans from Verizon. The Moto Z3 will be available to buy on August 16 from Verizon for $460, which is actually a pretty great price for the phone alone. Considering the Moto Z3’s high-end specs – even if it’s a little outdated – $460 is a pretty great asking price. Motorola is also knocking $300 off the Moto Z3’s price tag if you use its device payment plan and switch to Verizon while trading in your old phone. You could essentially get a reasonably priced phone for $160, which is phenomenal.